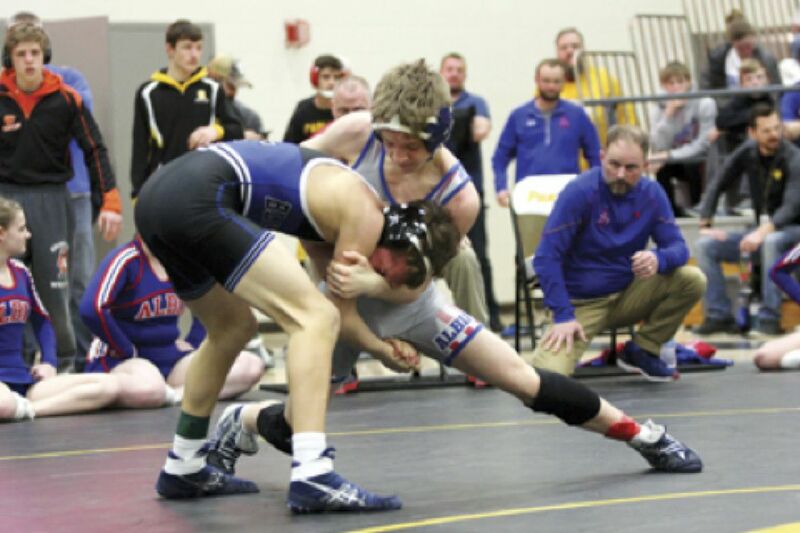 ALBIA FRESHMAN CARTER ANDERSON earned his first trip to the Iowa State Wrestling Tournament by finishing second in the district tournament. The Albia wrestler lost a razor thin contest to 32-1 Riley Anderson of Bondurant-Farrar. AN ANKLE INJURY robbed Albia 138-pounder Barrett Bonnett a chance to make the state tournament. Bonnett injured the ankle in the wrestleback and was severely limited in what he could do on the mat. ALBIA SENIOR Jer McAninch fell to eventual runner-up Reid Walters in his 195-pound match. McAninch finishes his senior campaign with a 23-9 record. Freshman Carter Anderson battled his way into the Iowa State Wrestling Tournament on Saturday in Knoxville, finishing runner-up at 106. Anderson crushed Will Emmons (20-19) of Carlisle 11-2 before meeting Riley Anderson of Bondurant-Farrar. Anderson entered the match with a 32-1 record after pinning Caydn Hall of EBF in 2:17. Anderson of Albia battled Anderson of Bondurant-Farrar to a 3-1 decision. Emmons went on to pin Hall in 36 seconds and did not receive a wrestleback. Anderson will wrestle at Wells Fargo Arena on Thursday evening at 6 p.m. in Session 3. His opponent will be Alex Beaver, 33-11, a sophomore from West Liberty. At 145, Barrett Bonnett’s day sort of reflected the season for Albia. He lost a close decision to Colby Tool (41-1) of PCM 6-0 and scored a 12-3 major decision over Darak Tingle (33-14) of Carlisle to earn a wrestleback against Garrett Jensen of Williamsburg. But Bonnett suffered a severely sprained ankle early in the match. At 195 Jer McAninch lost his first match to Gabe Hemstead (32-8) in a 15-1 major decision, then fell to eventual runner-up Reid Walters of Chariton 7-3. McAninch ends a fine senior season at 23-9.